Good day to all Central CT Youth Hockey families. As we are opening the chapter on the 2019-2020 season, we have already started planning for next fall. The CCYHA Bylaws mandate that each year, we have an annual meeting. At this time, we encourage any and all members in good standing to come to the meeting. Members can address the Board or could just be present to hear the re-cap of the year. We will also elect all the new members of the Board and say thanks to the old ones departing. According to the bylaws, we formed a nominating committee, and went over the applicants for board positions and the nominating committee has put forth the following slate to be voted in or challenged at the meeting. As a member, you are also allowed to challenge any board position if you desire to do so. You need support from the membership and this would bring on a vote at the annual meeting. If you have interest in this option, please contact me for the guidelines. This meeting will also be a forum for open discussion on any matters that any member would like to put on the table. Thank you all for such an enjoyable season of hockey and fun and look forward to another great year in 2019-2020! June 3 - August 15 - CCYHA will be providing ice for players for drop-in 3v3 each week. Mites/Squirts and PeeWees/Bantams will each have one hour per week. The master CCYHA schedule will be loaded with this ice. Daily Hockey Skills Sessions. 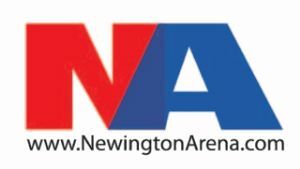 Check the schedule at www.newingtonarena.com for exact times. Work in a small area on your skills with or without a coach. No age limitations. 15.00 per session. 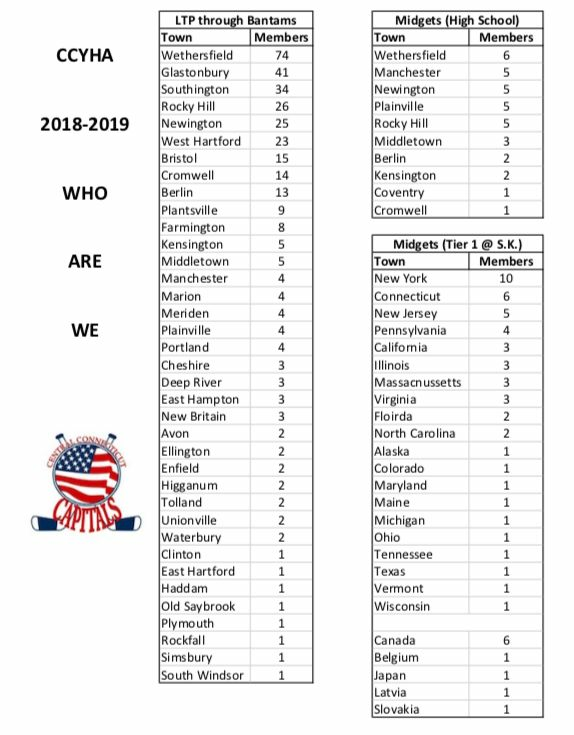 Any player that was part of Central CT Youth Hockey in 2018-2019 and will NOT be playing for CCYHA in 2019-2020, you must obtain a USA Hockey release. You must follow the below link and submit a release request. Our registrar, Aaron Odell, will process these in a timely manner. Per USA Hockey rules, releases are not valid if they are sent directy to parents, they must be sent to CHC. Parents will not get a copy of the release but they can check the release status on the CHC site (www.chchockey.org), although they dont update the list very often. 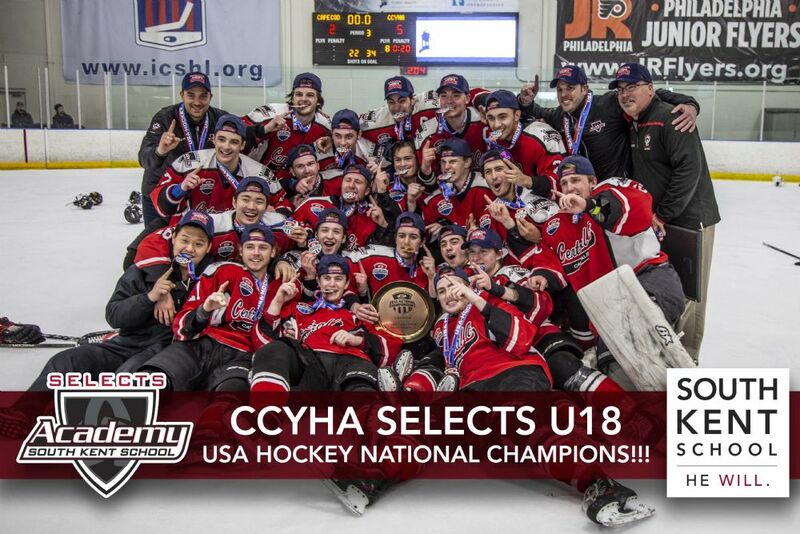 The CCYHA U18 Tier 1 Midgets completed their quest for a BACK TO BACK National Championship by defeating the North Jersey Avalanche 3-2 in overtime. The CCYHA Selects started the national tournament with convincing wins over the Belle Tire 9-1 and Washington Little Caps 5-2. Game 3 brought a loss for CCYHA at the hands of the Boston Jr. Eagles by a score of 4-1. By going 2-1 in the opening round, the team earned the top seed coming out of their bracket. The opponent in the quarterinals would be #1 nationally ranked Shattuck St. Mary's. CCYHA was up to the test as they advanced to semifinals by defeating Shattuck 8-6. In-state rival Yale Jr. Bulldogs was the opponent in the semifinal round. CCYHA earned a berth in the national championship game by defeating Yale 6-2. The final game was a matchup against #5 nationally ranked North Jersey Avalanche. After CCYHA took a 2-0 lead late in the third period, the Av's tied it up with 2 goals in a 14 second span in the final minute of play to force overtime. 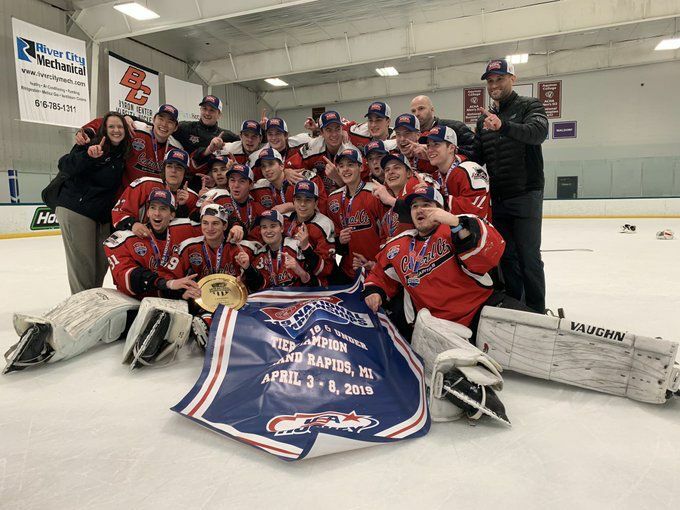 The game ended early in the first sudden overtime period as Killian Rowlee secured the second of the back to back National Championships for CCYHA. Congratulations to former CCYHA player, Brennan Horn, on being selected to the USA Hockey U17 National Camp. Nintey of the best players from New England recently competed at the New England Regional Camp. From there, Brennan was one of only 10 players selected to attend the USA U17 National Camp. Brennan will compete with the best players from all over the United States June 25th to July 1st in Amherst, NY as part of the National Development Program. Brennan played at CCYHA from Learn To Play through Bantams. He then went on to play two years at Northwest Catholic High School and has recently commited to play Prep School hockey at Westminster for the upcoming school year. With players jumping from program to program these days to play for "AAA" or "Tier 1" teams, this is a great example of how you can develop at any level. Congratulations and Best of Luck to Brennan !!!!!! CCYHA is proud of our long standing partnership with South Kent Selects Academy, and are here to continue providing support for their quest for a National Championship. Wishing luck to our defending champion U18 and U15 team as they head to Nationals in Michigan. Also competing at the Tier 1 Nationals are former CCYHA Players; Cam Partridge (Yale U16), Ryan Pineault (Yale U18). Early sport specialization does not guarantee future stardom. If anything, it may make eventually reaching an elite level in said sport more difficult. "After analyzing the data, the researchers found that the mean age of beginning any sport was 4.5 years, and the mean age of specializing in ice hockey was 14.3 years. Only 12 percent of the athletes specialized in their sport before 12 years of age. Most of the athletes played two to four sports as children, with soccer and baseball being the most popular in addition to hockey. The mean age of specializing in ice hockey—around 14—was consistent across professional, NCAA Division I and NCAA Division III players." "If you only play one sport, you (do) miss out on sports diversification, which is the idea that being a really good soccer or tennis player may help you be a really good ice hockey player," Matthew Silvis, a researcher on the study and the team physician for the Hershey Bears minor league hockey team, told ScienceDaily. "We've seen a lot of professional athletes coming out in support of this, saying that by playing a lot of sports you'll learn many skills and work different muscle groups that will help you if you specialize in one sport later on." This was a rather small sample size, but bigger studies have found similar results. For example, a 2017 study from the Rothman Institute at Thomas Jefferson University Hospital analyzed 3,090 athletes (503 high school, 856 collegiate and 1,731 professional) and found that the average high school athlete began specializing in their sport at 12.7 years old while the average collegiate athlete specialized at 14.8 years old and the average pro athlete specialized at 14.1 years old. One of the most telling findings in the study was that only 22.3% of professional athletes said they "would want their own child to specialize to play a single sport during childhood/adolescence." A 2017 study from the University of Wisconsin found that high school athletes with a "high specialization classification" had an 85-percent higher incidence of lower extremity injuries than high school athletes with a "low specialization classification." Essentially, athletes who specialized were found to be at a much higher risk of lower extremity injury than athletes who play and train in multiple sports. Six-time NHL All-Star John Tavares is a great example of how multi-sport youth athletes can ultimately blossom into superior hockey players. Growing up in Ontario, Tavares traded in his skates for a pair of cleats and a lacrosse stick every summer. He only began specializing at age 16, and he believes his background in lacrosse gives him a definitive edge on the ice. "My mom never really believed in the summer hockey, all year-round. I needed a break and I always looked forwarded to the lacrosse season. And when hockey season came around I was really looking forward to that. It was good both ways to help myself in both sports," Tavares told NHL.com in 2009. "The biggest is moving in traffic, shooting in traffic, making plays while guys are on you...When you're able to do that, you're able to draw guys toward you, make those plays in traffic, I think it creates a lot of chances offensively. Also rolling off checks -- when you roll off checks or lean into guys, use your body to create room, you do a lot more of that in lacrosse because it's such a possession game. You learn to make room for yourself, like in hockey...(It) definitely translates a lot." USA Hockey's American Development Model, an initiative designed to help more American kids "play, love and excel in hockey", strongly encourages kids to play multiple sports during their childhood and pre-teen years. "I like the fact that kids are encouraged to play other sports. Hockey is a great sport, but playing other sports definitely helps you become a better hockey player," NHL all-star and 2014 U.S. Olympic captain Zach Parise said of the ADM.
Central CT Youth Hockey (CCYHA) will be forming split season teams at the U16 and U18 Tier 2 levels for the 2019-2020 season. Building off the success of our youth teams, we are forming these teams to fill a void in our area at the Tier 2 level. Teams will be competing in CHC Tier 2 with the winners of the CT State Tournament advancing to the USA Hockey Tier 2 National Championships. Teams will practice and play at Newington Arena and Wesleyan University. The registration system has been set up for travel team tryouts for the 2019-2020 season. Any player who is trying out for travel hockey is required to register for tryouts. The tryout schedule has been posted under the tryout tab on our website. TRYOUT REGISTRATION WILL CLOSE ON MONDAY MARCH 18th for Mite through PeeWee tryouts and WILL CLOSE ON SUNDAY APRIL 21st for Bantam tryouts. The tryout fee of $100.00 is due at the time of online registration. Players will be split into groups and attend three tryout sessions (except for u8 mites). Players must attend the tryout times assigned to them. 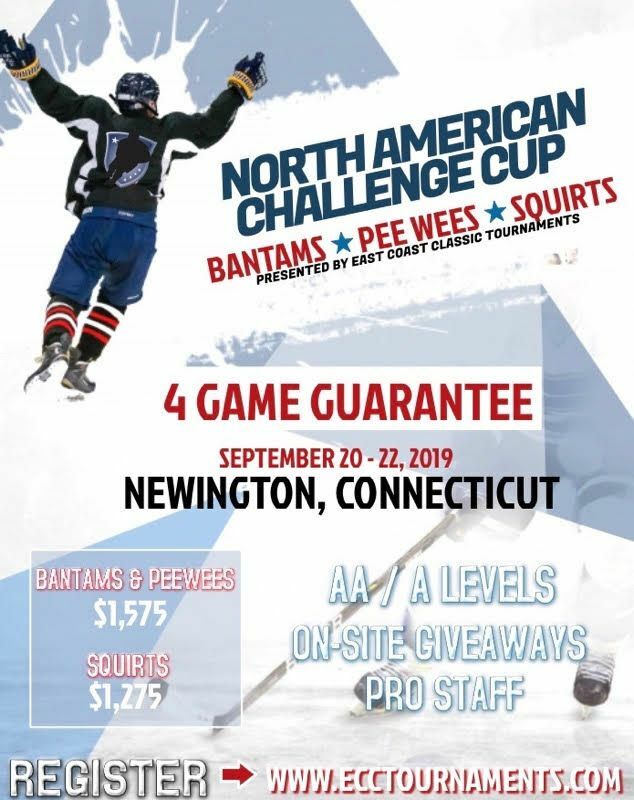 All Mites will attend the same session, Squirts through Bantams will be split by last name; A-L and M-Z for first tryout (no switching times allowed). After the first tryout, all players will be split into 2 groups (not alphabetically) and must come to the tryout time they are assigned to. The updated list will be found on the Central web site after each tryout under the tryout tab. Players who plan on participating in house league, mite development, or learn to play next season do not attend travel team tryouts. PLEASE MAKE SURE YOU SCROLL ALL THE WAY DOWN TO THE BOTTOM OF THE REGISTRATION PAGE AND ENSURE THAT YOU ARE COMPLETING THE REGISTRATION FOR 2019-2020 TRYOUT REGISTRATION. 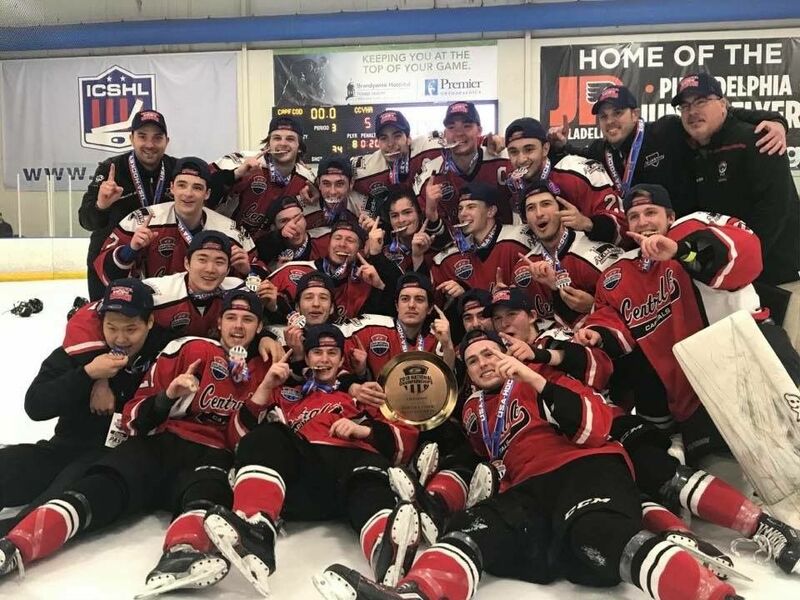 The Central CT Youth Hockey Selects Academy u18 Tier 1 team wins the NATIONAL CHAMPIONSHIP by defeating the Cape Cod Whalers 5-2. Congratulation to the midgets on winning a national championship for CCYHA. 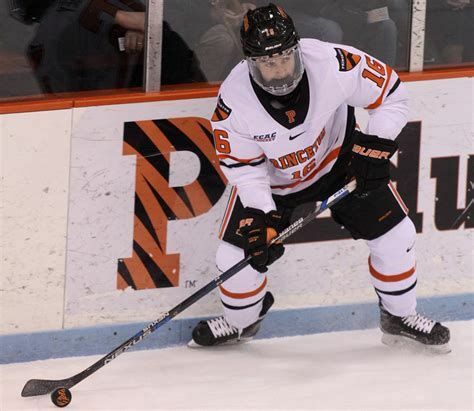 Fresh off an NCAA tournament birth with his Princeton University team, former CCYHA player David Hallasey, has signed with the AHL Hartford Wolfpack and played in his first game on April 6th. Congratulations and best of luck to David. An App specifically designed for Hockey Parents! Rink Rater is essentially the Yelp for Hockey Rinks! With users leaving reviews on hockey-specific categories, you can tell if a Rink has Skate Sharpening (& do they know what they're doing? ), a Pro Shop, Concessions, Wi-Fi, What's Nearby, and a bunch more! There is even a spot for Ref's to let each other know where their Locker Rooms are and if there are hot showers!